Working with a new attorney, Friends of the Loew’s (FOL) convinced Hudson County Superior Court Judge Hector Velazquez that it may indeed have a valid lease with Jersey City that would prevent AEG from taking over. Only last month, Velazquez tossed the suit, ruling that the lease was not valid. After today’s decision, the lawsuit is back on. With all due respect to the Mayor’s spokesperson, Friends of the Loew’s is not trying to run out the clock. On the contrary, we are the group that has been patiently waiting for 10 years for the City to do what it committed to do and work with us toward the goal of expanding the operation of the Loew’s as a performing arts center. Unfortunately, for all those years, the City hasn’t done this – so FOL has been forced to find ways to keep the Loew’s open and even expanding, albeit not to the extent we want or would have been so if the City had cooperated. Consider that the City has been saying it is willing to fund up to $40 million in renovations to the Loew’s before AEG can use the Theatre to put on shows that will make money here for AEG. The incongruity is glaring when, in light of this, the City turns around and complains that FOL is not doing enough with the Loew’s in its present condition. What FOL and the City agreed to 10 years ago was a progressive approach in which the City would fund the most basic repairs and upgrades to bring the Loew’s into compliance with the City’s own codes. This would have removed a big barrier keeping FOL (or anyone) from doing much more programming here. And in that approach, the City also agreed to provide FOL with funding for the kind of independent, arts management experts who have helped guide the creation and growth of performing arts centers around the country. Their knowledge was to help FOL, and reassure the City, by putting together a realistic plan for including major, revenue generating concerts (such as AEG can provide) in a larger mission of promoting local arts, diversity in the arts, affordable programming and community service. 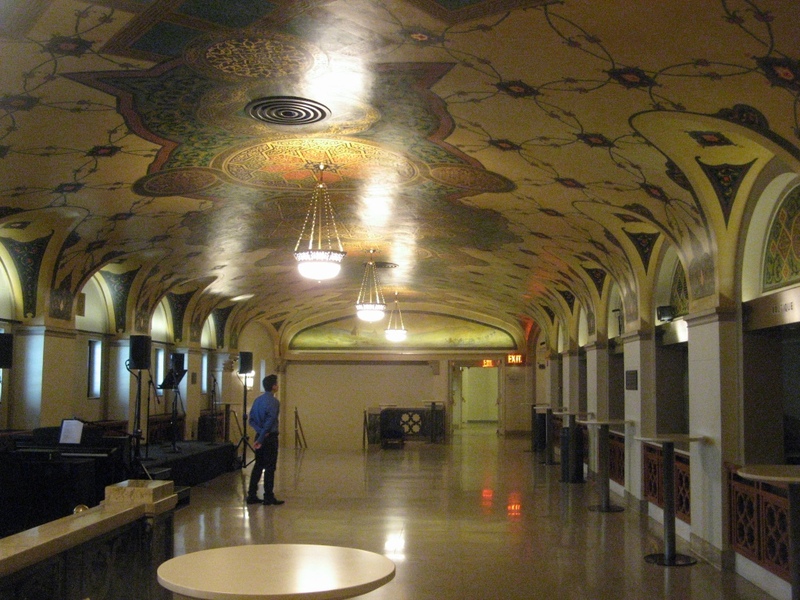 And with that plan in place, the code-related repairs taken care of, and the demonstrable support (as opposed to foot-dragging or out right opposition) of our partner the City, FOL would have been in position to look for grants and donations to reduce the amount of any additional money the City might consider putting into the Loew’s. In a recent blog, Mayor Fulop talked about how important it is in the life of any city to ensure access to the arts for all – especially the young and those not so well off. FOL couldn’t agree more – in fact, we first said this when began the effort to save the Loew’s over two decades ago. But the Mayor is not correct to suggest that these important goals can be achieved in an arrangement that is led by a commercial promoter. It doesn’t take an expert in arts management to anticipate that even under the best of circumstances, the for-profit imperative of the consortium Mayor Fulop wants will inexorably push all other kinds of events to the margins, especially if, as the Mayor has suggested, the consortium will be under pressure to give the City money to pay back some of the tens of millions he anticipates providing. Artistic diversity, affordability, support for local arts, community interest are all goals that spring from something other than the profit motive. Put simply, it’s the difference between public TV and commercial TV, between the Wellmont Theatre and BAM. It’s why America’s most vibrant arts centers are run as non-profits, and why some of the most exciting urban revitalizations have been anchored by those arts center . And it’s why we are fighting to preserve our lease and vision for the Loew’s. We still hope that Mayor Fulop will come to see that the approach FOL has advocated for years is the one that will achieve the goals he so eloquently quoted for the arts in Jersey City. Many of you know that last week, some of FOL’s staff took part in the League of Historic American Theatres’ annual conference, held this year in New York City. 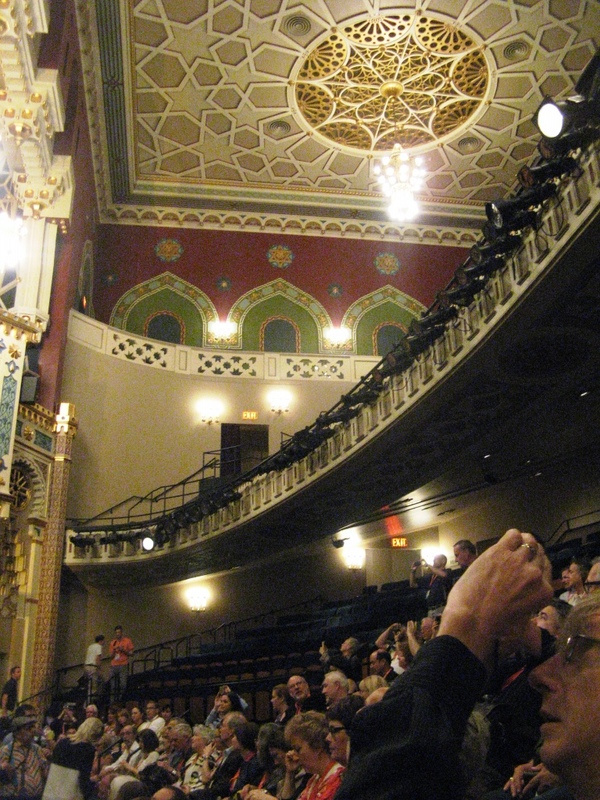 Parts of the conference were just fun – especially the tours of Broadway theatres. We’ve posted some photos and stories from the tours on our Facebook and on our blog. But the real purpose of the conference was to gain practical information and insights about theatre operation — and there certainly was a lot of good info in the seminars we attended and in the conversations we had with staff members of other theatres around the country. We’ll talk about some more of what we heard in upcoming posts. One of the most immediately relevant things we heard was about City Center in New York City — because it gives very useful perspective to something Mayor Steven Fulop has been trying to claim. 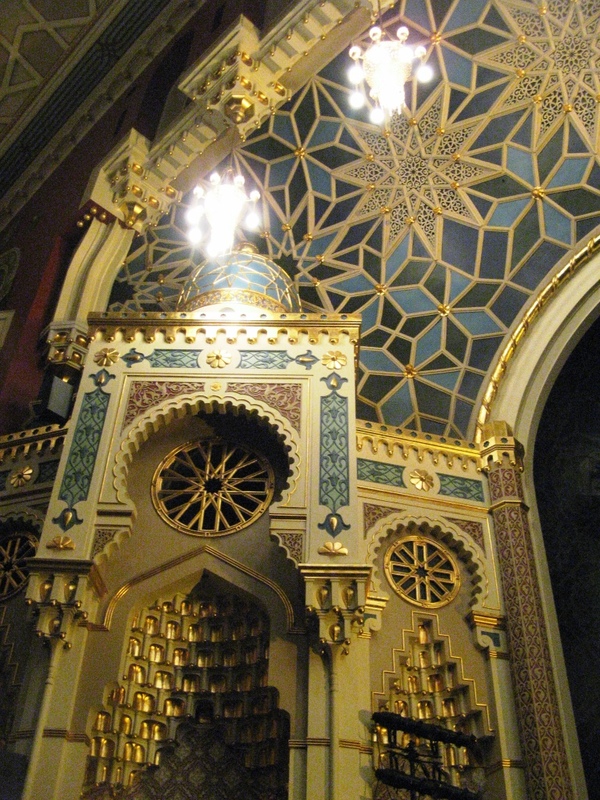 As you probably know, Mayor Fulop is pushing hard for Jersey City to turn its back on the goal of ensuring diverse programming and affordable access to the arts through working with FOL to expand the operation of the Loew’s Jersey Theatre as a non-profit arts center. In a recent blog post, Fulop tried to equate his scheme for the Loew’s with how NYC’s legendary Mayor Fiorello LaGuardia tried to give all New Yorkers access to the arts: “LaGuardia, believed that art was a concern of government and should provide as many opportunities as possible for all city residents, especially those less well-off, to experience the joy of taking in concerts, shows and exhibits. Of course, he was right.” Fulop said. The trouble is, what Fulop is trying to do with the Loew’s is the OPPOSITE of LaGuardia’s approach. And that’s where City Center comes in. City Center was created by LaGuardia to be New York’s first performing arts center, a kind of Everyman’s Carnegie Hall where drama, music and dance would be affordable and welcoming to all . . . so LaGuardia certainly did not put a commercial company in charge of the place. Why? He understood the very basic fact that when the drive to make money is paramount, affordability and diversity in the arts get pushed aside. He had a higher vision. City Center is run by a non-profit that rents space to some of the City’s best and most innovative dance and other arts organizations; presents some programs with other arts organizations; and produces several theatre and dance series of its own with the goal of creating high quality and affordable programming that will attract more people – especially young people – to the performing arts. Always, the emphasis has been to make the best in music, theater and dance accessible to all audiences. A large percentage of City Center’s income comes from rentals to arts organizations, and is augmented by some commercial rentals. The Center raises private donations and seeks grants. And New York City contributes some funding and also covers at least some utilities. And when City Center undertook a major restoration and renovation a few years ago, New York City was a lead contributor. If anything, City Center is far more analogous to the goals FOL outlined when we began the fight to save the Loew’s – and which, by the way, Jersey City formally adopted as its own in our lease ten years ago — than to the commercially driven operation Fulop has in mind. The analogy, of course, is far from exact. For one thing, many of our local arts organizations are younger or smaller than those that use City Center, and therefore find it harder still to afford even reasonable rent. But this is all the more reason why the Loew’s must be guided by a mission that’s about more than just making a profit; and even City Center does find it necessary to work with organizations that can’t afford its rent. Another big difference is that the Loew’s and FOL’s vision have unfortunately never benefited from the kind of support New York has given City Center over the years – support that helps attract even greater support from private funders. Considering Jersey City’s lack of follow through on the modest commitments it made to FOL and the Loew’s in our lease, FOL’s operation of the Theatre has at least demonstrated in microcosm what would be possible with greater support from the City: affordable programs, festivals of local arts, programs with City schools and colleges, some multi-cultural programs and community service events, and a few commercial concerts. As at City Center, rentals have been a major source of income. 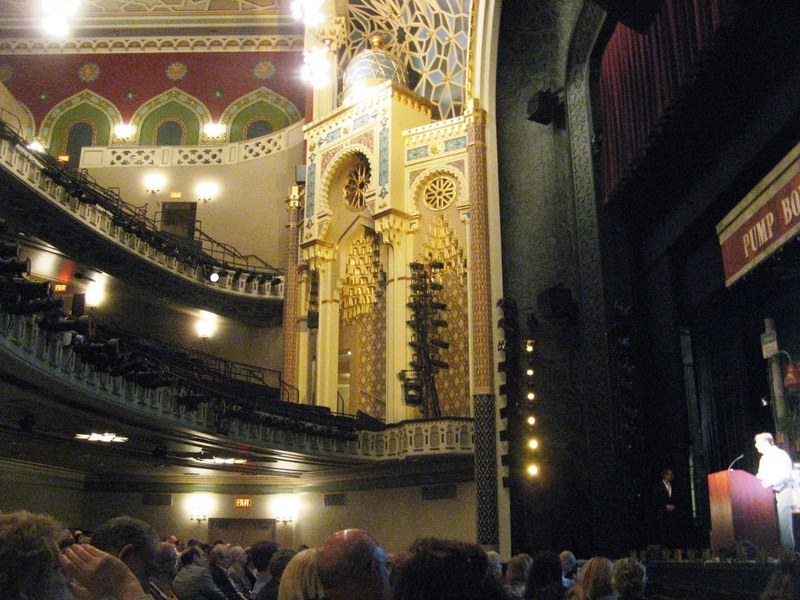 Like all arts centers, the Loew’s presents its own challenges and opportunities. There’s never been a question that the Loew’s will have to book some commercial programming – more than City Center – to help generate income to support other programming. And with the Loew’s even larger seating capacity than City Center (once Jersey City takes care of the code violations that prevent us from using the balcony) this is viable. But this MUST be done in a structure that keeps the mission to promote diverse and affordable arts and server our community in the forefront, not an afterthought. One part of the plan for the Loew’s that Jersey City government agreed to, but has ignored for 10 years is to allow FOL to use independent, professional arts management expertise to help create a practical, reliable structure to keep the focus on serving our community with affordable, diverse arts while also including and taking advantage of opportunities for commercial programming. Like his predecessor, Fulop is ignoring this. But even worse than his predecessor, Fulop is trying to press ahead with an approach for the Loew’s that has no independent, expert arts management input or assessment. The result would not be good. If Mayor Fulop really wants to follow in LaGuardia’s footsteps and ensure access to the arts in Jersey City, he needs to work with FOL and ensure real arts management planning. We’ll talk more about that in our next post. We’ve included a few photos of City Center that we took on our tour; the results of the recent restoration are impressive.